Adrian Moynes, former Head of Radio in RTÉ said to me, in 2009, "your interviews with some of the most important cultural and political figures of our time, are unique social documents. It would be a shame if those tapes ended up in a skip when you die." That comment crystallized a thought that had been haunting me since August 11th, 2007, when I did have, let's say, a night-long dance with near-death in 2007. So in response to the comment made by Moynes I set out to make sure the interviews would not end up in a skip. 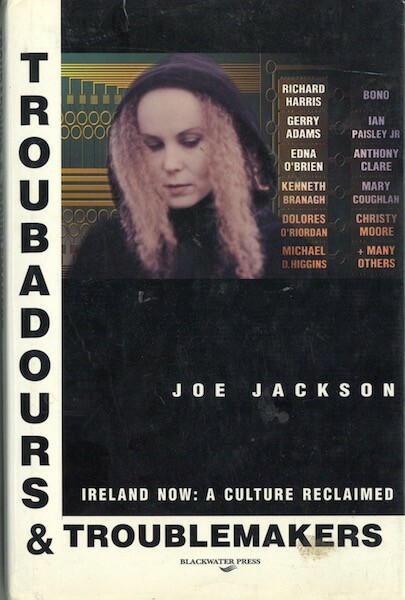 Firstly, I had published a series of articles titled The Joe Jackson Files, then I wrote a series of Ebooks in the style of my 1996 anthology Troubadours and Troublemakers: Ireland now: a Culture Reclaimed, and more recently I presented a radio series titled, The Joe Jackson Tapes Revisited. It was nominated for an IMRO award in the Best Speech in the Music Documentary category in 2018, which indicated to me that maybe more than one or two people would prefer if my tapes were in the public domain rather than relegated to a scrap heap. Others may disagree! Either way, I'd like want to make this archive of 1,300 tapes available to the public. To do so I need to digitize my tapes at a cost of 25,000 euros, half of which I hope to raise via Fund it and the balance through (a) the sales of interviews as downloads or CDs after they are digitized and/or (b) by finding a financial backer. 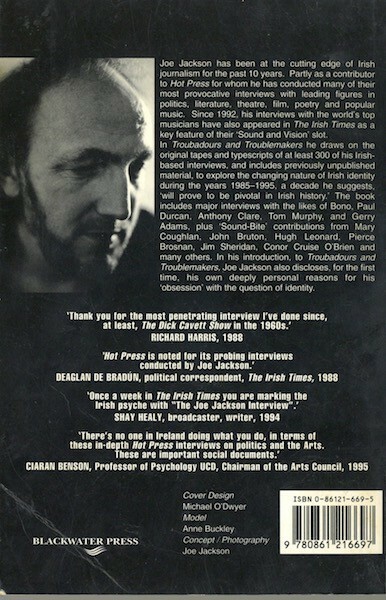 Below, listing some of my interviewees up to 1996 is an image of the front/back covers of Troubadours and Troublemakers. The budget will allow me to have at home a second sound processing set-up, in a space that won't interrupt my daily work, and will include, for example, a laptop, Focusrite Scarlett 2i4 interface, Isotope RX 7 software, plus cassette, Dat and mini-Disc recording decks. All of this equipment needs to be purchased. A company offered to transfer the tapes for 25,000 euros, but as a radio producer, I want to do added audio restoration myself on all tapes. 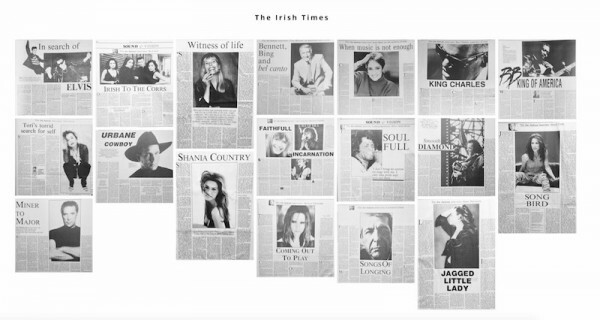 The sound must be of the highest possible quality, particularly for institutions such as the National Library of Ireland, who are interested in my archive and could perhaps play them during exhibitions about, say, Edna O'Brien. The licensing value of these interviews is also considerable and I am currently involved in negotiations with a movie director who wants to use my Richard Harris tapes for a major movie. My model for all this is The Studs Terkel Archive - https://studsterkel.wfmt.com/. I also wish to fund a similar website for The Joe Jackson Archive. I believe that the taped exchanges should be available in full to the public. I hope to make three - five tapes available on a weekly basis. I sincerely thank anyone who has read about this project, and who is even considering helping me make it materialize. One CD and/or a download of your choice with any of the celebrities I have interviewed. This will be one-hour of highlights, in the style of my radio series The Joe Jackson Tapes Revisited. Plus a scan and/or typescript of the article. As previously listed but now including two CD's and/or download and a high-quality scan and/or typescript of the original article as published, and Ebook. As previously listed but now including ten CD's and/or downloads. As previously listed plus a one hour workshop on the art of interviewing celebrities and/or a half-hour Skype interview about an interview.